Is Twitter — an American company — now enforcing Pakistani blasphemy law? It sure looks that way. On Friday, Canadian activist and blogger Ensaf Haidar said she received notification from the social media site that a tweet she posted violated Pakistani law. 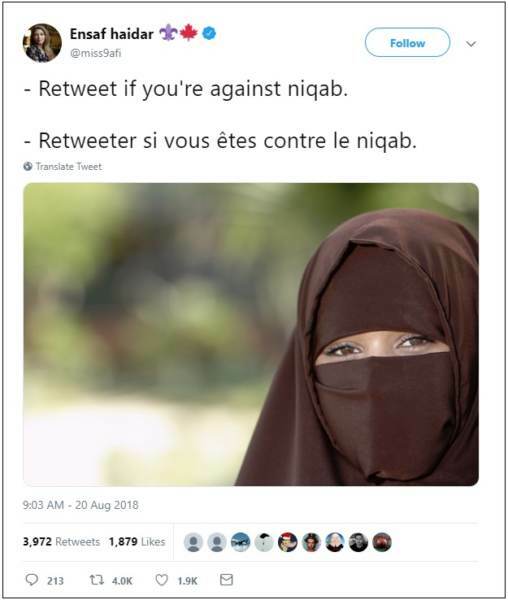 According to the Gateway Pundit, the ban was prompted by another tweet asking followers to retweet if they oppose mandatory niqab laws. As of this writing, however, it seems her account is fully functional. Nevertheless, Twitter’s action has many scratching their heads. Indeed, it seems that Facebook isn’t the only Silicon Valley social media site now propping up Islamists. Really! Pak law is the Twitter law. Never knew that. Unbelievable. The same Pakistan that send Jihadis to spread terrorism every quarter in India? They're talking about law. A Canadian citizen breaking Pakistani law while sitting in her house in Canada... Wow @Twitter ???????????? Indeed. Welcome to “1984,” courtesy of far-left Silicon Valley tech giants. In 1989, former President George H.W. Bush said that “… the day of the dictator is over.” Sadly, it’s not. Dictators like Saddam Hussein and Adolf Hitler are gone, only to be replaced by another set of dictators, with far more power and absolutely no accountability.